Blackstreet (often stylized as BLACKstreet} is an American R&B group founded in 1991 by Chauncey Hannibal and Teddy Riley, the inventor of New Jack Swing known for his work as a member of Guy. Chauncey Hannibal and Levi Little were signed under contract with Thomas Taliaferro and were merged into what became Blackstreet featuring Teddy Riley. The current members are Teddy Riley, Dave Hollister, Mark Middleton, & Eric Williams . The original members of Blackstreet were Teddy Riley, Chauncey Black , Levi Little, and Joseph Stonestreet. Stonestreet was replaced however, by Dave Hollister before they began work on their self-tiled debut album. The name Blackstreet is a portmanteau of the nicknames of Hannibal (Chauncey Black) and Joseph Stonestreet (Street). The group is notorious for doing the dance move "The Lean" at concerts. The original lineup released their first single in 1993 on the soundtrack to the movie CB4 starring Chris Rock titled "Baby Be Mine" featuring Joseph Stonestreet on lead and produced by Teddy Riley and written by Teddy Riley and Joseph Stonestreet. Stonestreet however left the group shortly after the single was released due to personal differences with Riley and was replaced by Dave Hollister. Their debut album, Blackstreet, was a moderate success due to the singles "Booti Call", "Before I Let You Go", and "Joy" – two of the three songs were Top 40 hits ("Before I Let You Go" hit the Top 10). 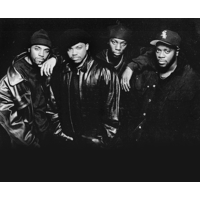 The follow-up, 1996's Another Level (see 1996 in music) was a breakthrough success due to the top single "No Diggity" (with Dr. Dre), which was a #1 hit on the Billboard Hot 100 in November 1996, and won the 1998 Grammy Award for Best R&B Performance by a Duo or Group with Vocals, along with the Top 40 hit "Don't Leave Me" which was a big hit in 1996. Another Level eventually went four times platinum in the United States and peaked at #3 on the Billboard chart. "No Diggity" is ranked at #91 on Rolling Stone and MTV: 100 Greatest Pop Songs, while Blackstreet comes in at #214 of the Top 500 Pop Artists of the Past 25 Years. Another Level featured Mark Middleton & Eric Williams in place of Dave Hollister & Levi Little. The success of the album "Another Level" landed them a guest appearance on Jay-Z's "The City Is Mine" and they teamed with Mya and Mase for the hit "Take Me There" from the Rugrats soundtrack. The success of "Another Level" would also land them a spot on New Edition's 1997 Home Again reunion tour. Riley recorded a reunion album with Guy in 2000, and subsequently began working on material for his first solo record. However, he had second thoughts about disbanding Blackstreet, and patched things up with Hannibal; Middleton and Williams, returned to restore the Another Level lineup, and Riley's solo project became a Blackstreet reunion. The resulting album, Level II, was released in early 2003. Mark Middleton & Eric Williams have returned to the group the group now consists of Teddy Riley, Dave Hollister, Mark Middleton & Eric Williams. This lineup is embarking on a big tour and record a new album for 2011. Chauncey Hannibal is no longer in the group due to a falling out with Teddy Riley.